Scroll down the page to see all photos, or click one of the links above to view that event. 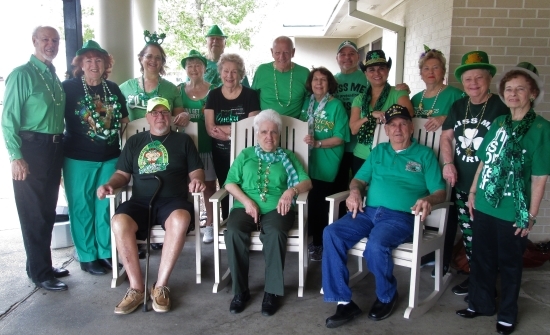 The Slidell Elks Line Dancers visited and entertained Veterans and residents at Heritage Manor in Slidell to celebrate St. Patrick's Day. Green was the color of the day. The residents sang along and tapped their feet to the music. Some even got up and danced a little. 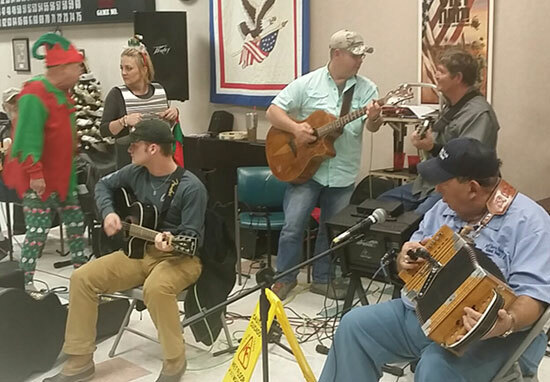 Pictured seated, Skip Springer, Rose Fontenot, Allen Landry, (Skip and Allen are Veterans). Standing left to right, Pat Massarini, Carol Massarini, Cathy Springer, Tina Stout, Dennis Guenard, Walda Sbisa, Paul Niehaus, Pauline Mintz, Pete Spadoni, Kathy Spadoni, Lou Landry, Ellyn Campbell, and Evelyn Caronia. Pictured below are Brice Palmer, Past Grand Tiler, his wife Shyla and daughter Lyla. 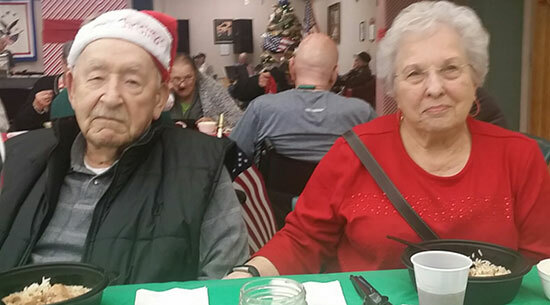 Pictured below are Retired Colonel and Mrs. Fakes. Pictured below is the band. 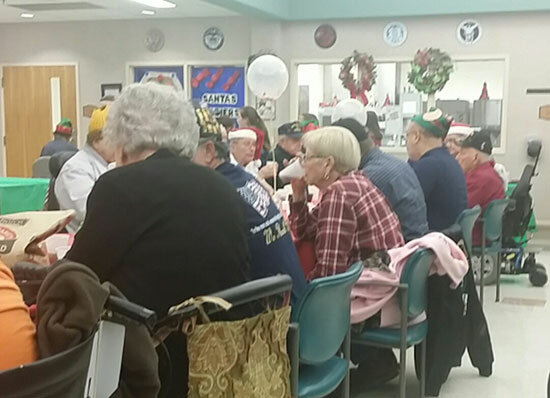 Pictured below are Veterans, Spouses and guests who attended the Christmas Party. 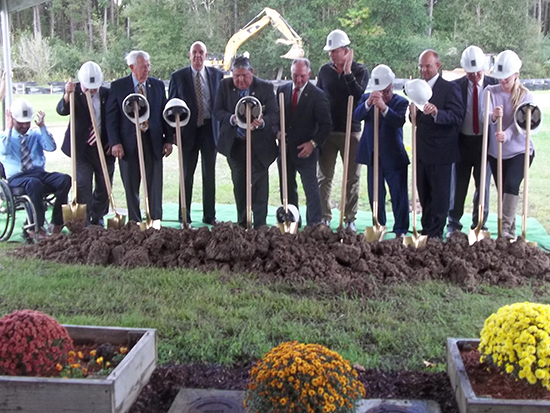 Pictured below is Governor Edwards and other dignitaries attending the Ground breaking ceremonies for the new Southwest Louisiana Veterans Cemetery in Jennings, LA that was held on November 5, 2018. 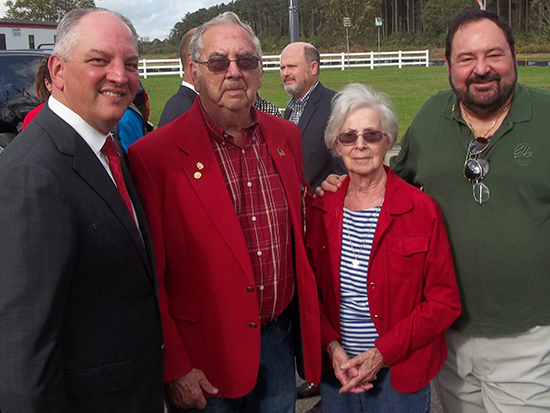 Below is Governor Edwards, Franklin Courville, PSP LEA, his wife Verona and LEA PSP Brice Palmer. (L-R) PGT Brice Palmer, (Guest Speaker)Alejandra Juan - Coordinator/Louisiana Dept. 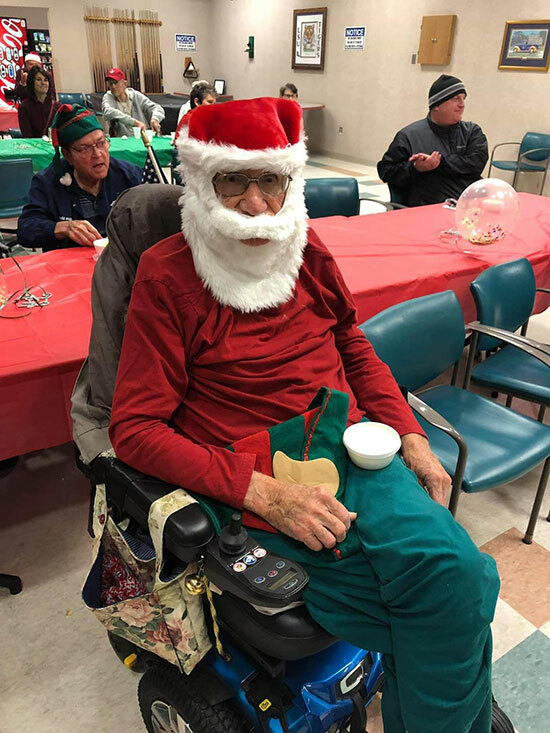 of Veterans Affairs and retired USAF Veteran resident Colin Fake. 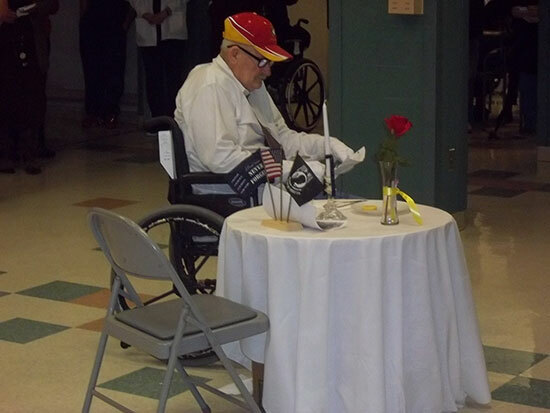 Veteran Marine resident Walter Gary performing the POW/MIA table ceremony. 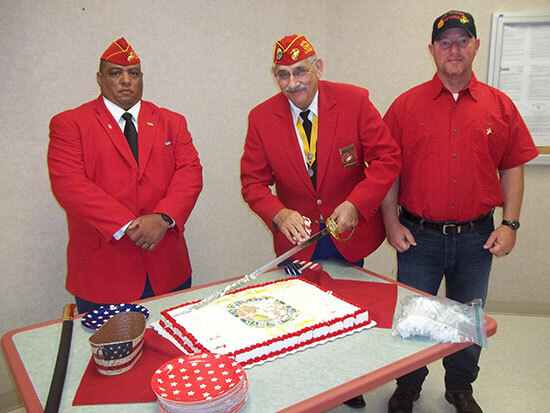 Acadiana area Marine Veterans celebration the Corps birthday with the cake cutting ceremony. 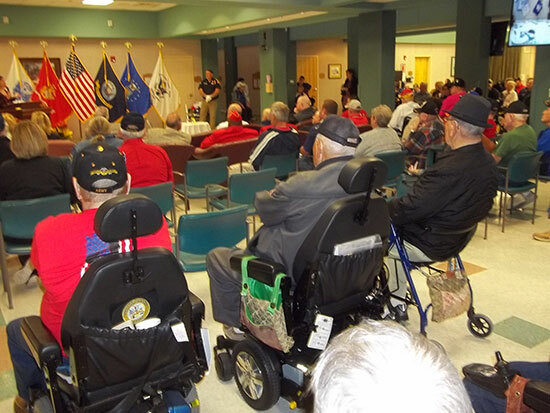 Some of the Veteran residents and their guest at the Jennings Vets Home attending the annual Veterans Day ceremony. 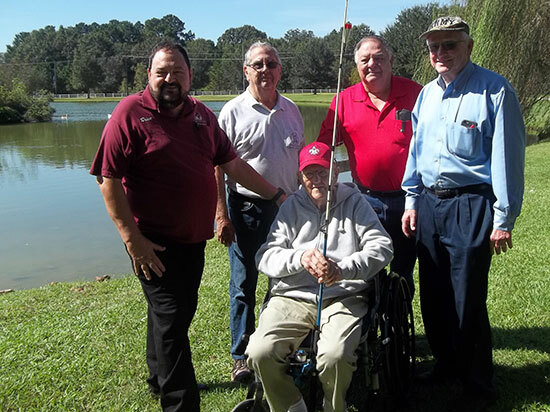 Assisting with the Annual October 2018 Jennings Vets Home Fishing Rodeo which the Louisiana Elks helped sponsor are (L-R) PSPs Brice Palmer, Franklin Courville, Butch Barron and Ken LaFleur with (seated) USAF resident Veteran Jimmy Broussard. 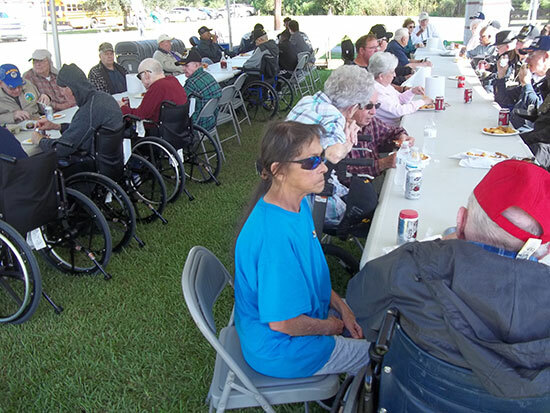 Veteran Residents, their families and guest enjoying the fried fish meal at the conclusion of their fishing rodeo. 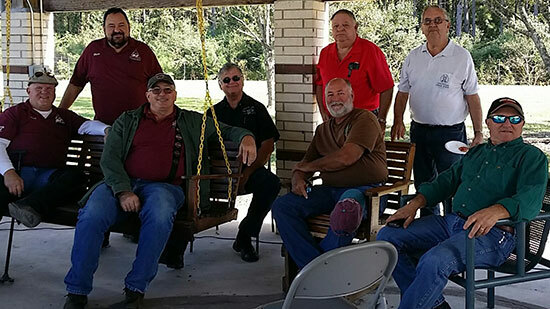 Members of the Lake Charles Chapter LA-J Goldwing Motorcycle group and our PSPs Brice Palmer, Butch Barron and Franklin Courville who assisted at the Vets rodeo. U.S. 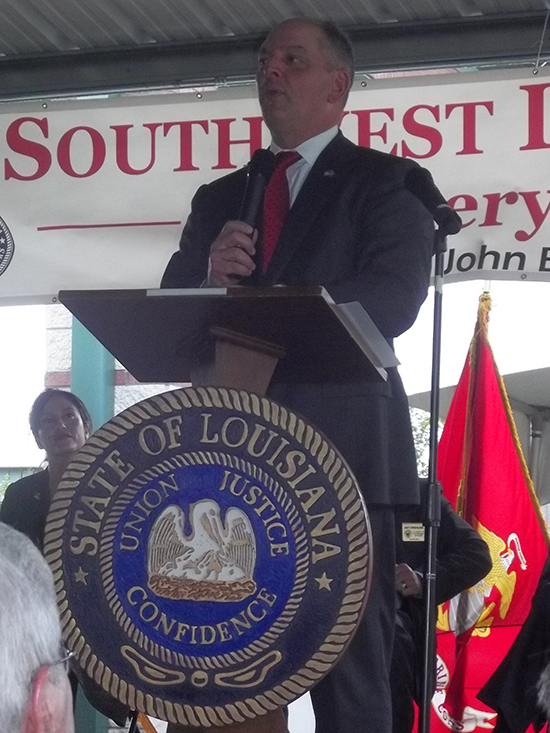 Congressman Clay Higgens was the keynote speaker at the Southwest Louisiana Veteran Home in Jennings for their Annual Veterans Day Program. 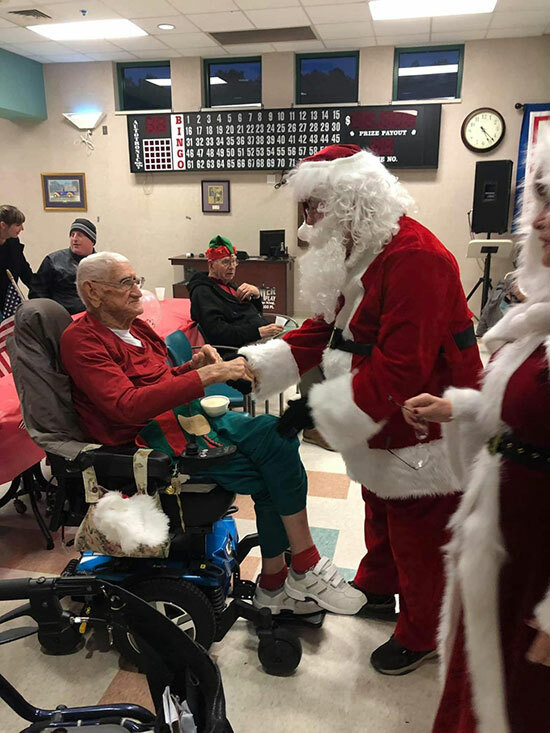 He recognized WWII Veteran, Sgt. Bollich (Ret.) with the Congressional Gold Medal. It is one of the two highest civilian awards in the United States. Sgt. 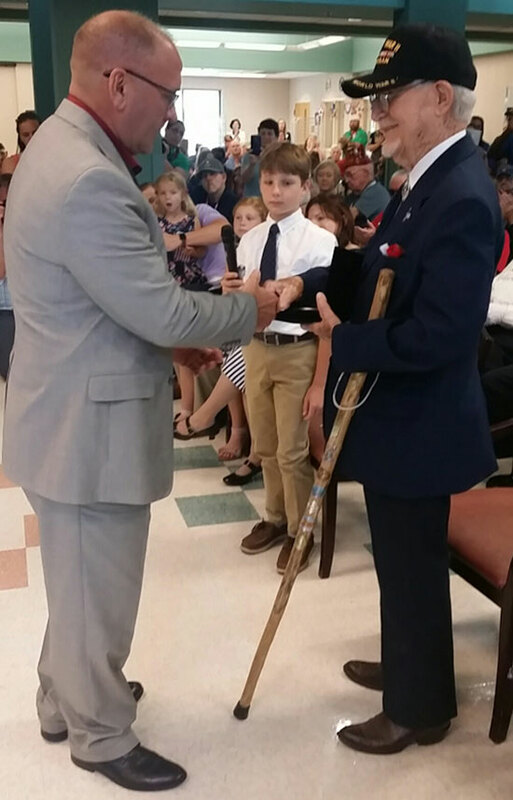 Bollich is a survivor of the Bataan Death March and was a POW for more than 3 years. 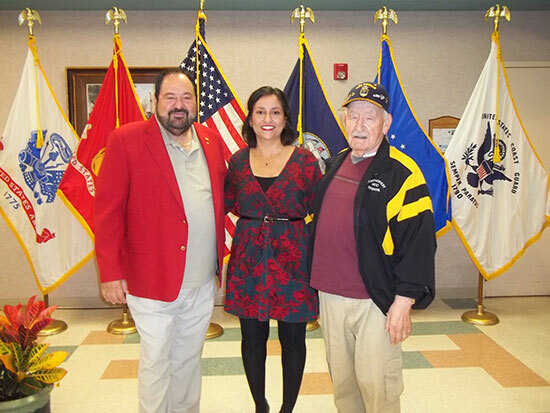 The Louisiana Elks Association is a proud sponsor of the Jennings Veterans Home and their programs. 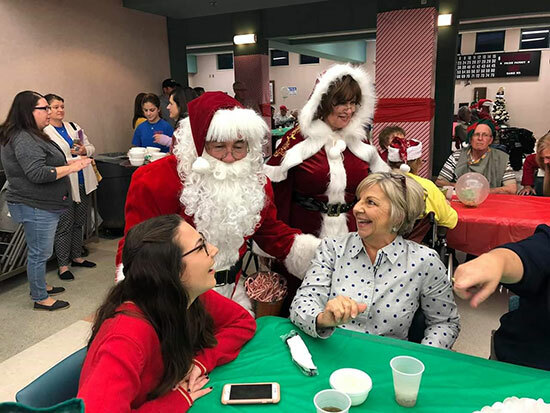 © Louisiana Elks Association, Inc. All rights reserved.